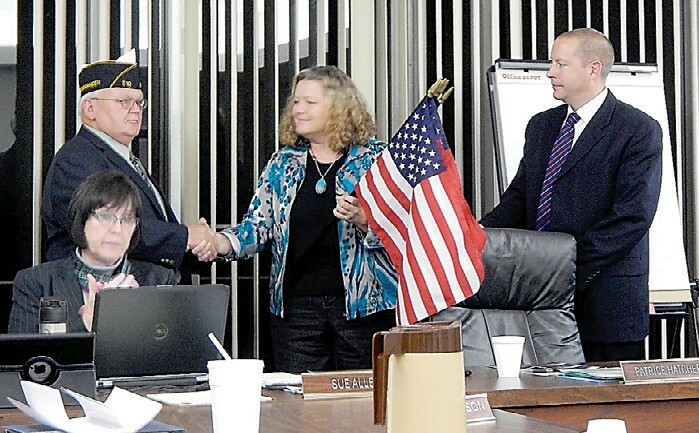 William Cool, sixth district commander for the American Legion of Michigan presents flag donations to Carman-Ainsworth school board President Patrice Hatcher and Superintendent Steve Tunnicliff. FLINT TWP. — Carman-Ainsworth Schools along with districts statewide have been required by law to display a flag in each classroom since a mandate was approved by the state legislature and signed by the Governor about a year ago. C-A is in compliance thanks to support from the American Legion of Michigan which has taken up the cause of donating flags to schools. Douglas Williams, state legislative affairs chairman, and William Cool, sixth district commander, attended the school board meeting last week to deliver more flags and also to accept thanks for their assistance. The presence of the flag allows, but does not require, students to recite the Pledge of Allegiance daily at school. The Legion has supported the law since its introduction in September 2011 by Sen. Roger Kahn (R), but also did not want to place an extra financial burden on schools, Williams said. Cool added that there are annual scholarships too and encouraged the board to spread the word to students and encourage them to apply. Williams also said that the Legion, same as many school districts, are preparing to help the future children of veterans. Most people in a community are well aware of all the Legion does, he said.